MogoBlog MogoLicious Tasty Tip of the Day: Chocolate S’mores Mug Cake is DANGEROUS! Stir the ingredients up, pop this baby in the microwave and one minute later you have a mug full of that warm ooey gooey chocolate you’ve been craving all afternoon long! Choose a microwavable mug. Make sure it’s big enough to hold at least 8 ounces. Add 2 Tablespoons of the chocolate chips or chocolate candy bar and 2 Tablespoons of the marshmallows. Roughly crush half of the graham crackers and add it to the mug. Stir. Microwave for 40 seconds. All microwaves cook a little differently so cooking times may vary. Since I prefer my cake a little on the underdone side instead of the overdone side I recommend starting with a shorter cooking time. I started with 40 seconds and it was just right. You can always cook the mug cake a little bit longer, I would cook in 10 second intervals until you get the desired doneness. Remember that in the next step you will be cooking the mug cake 10 more seconds. DON’T OVER COOK! Remove from microwave. Let set for a minute. Drizzle with hot fudge sauce and top with whipped cream or vanilla ice cream if desired. Serve warm! 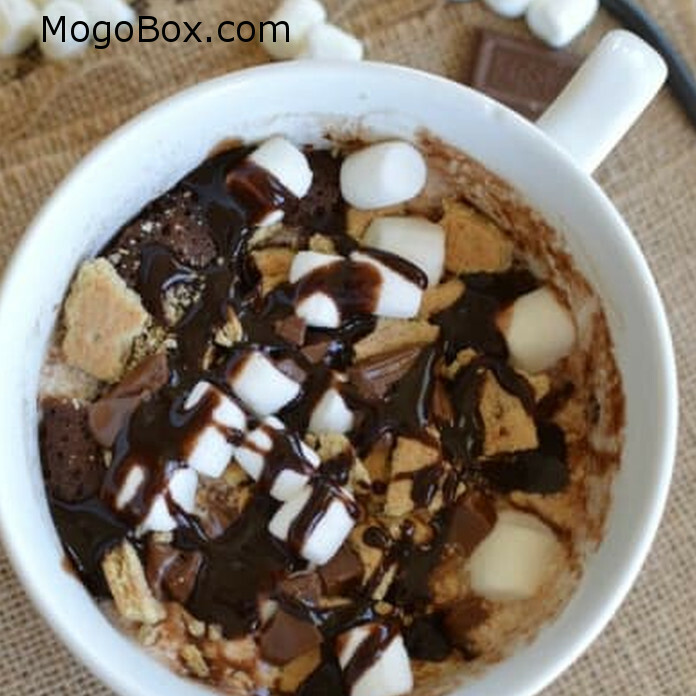 This entry was posted in MogoBlog, MogoLicious and tagged #MogoBlog, MogoBox, MogoLicious, Mug Cake, S'mores.